Very exciting! Buffing is such long/hard work but the outcome is pretty awesome! I took a dry erase marker to the outside of the tank and drew over every scratch that was on the inside, it really helped. you can also do this on the inside of the tanks also, when the ink is gone you know you have sanded enough to remove the scratch. I have not done this part but on my take I just got, also a 290 flat black hex. I plan on using a sharpie on all the scratches so I know when I get them all out. Welcome to the club of the 290 hex flat back! Great idea with the sharpie, we will be doing this tomorrow rather than the dry erase on the opposite side. I see a tank in this opening happening this week. Yayyyy. Wooo! This is always so exciting to watch it slide into place get the trim finished etc. Really gives you a feel for how the room is going to turn out. We are using compound, did you? If so, did you just rinse the heck out of it when you were finished? I'm worried of it leaving a trace of compound behind. Thanks for the compliment, it's coming along slowly but surely. I used the same Novus compound as you. 3 then 2 then 1. Inside and out. Didn't even think to wash it down when I was done. Just wiped the inside down with a clean buffing cloth. I have seen no ill effects from this. Here's a fork in the road we weren't planning for, remember that 20 g established tank Jeremy picked up? I transferred it to a 40 g breeder a little while back. Well... Folks tonight we have Ich on one fish. I'll start to get a hospital tank going tomorrow to start hypo salinity. 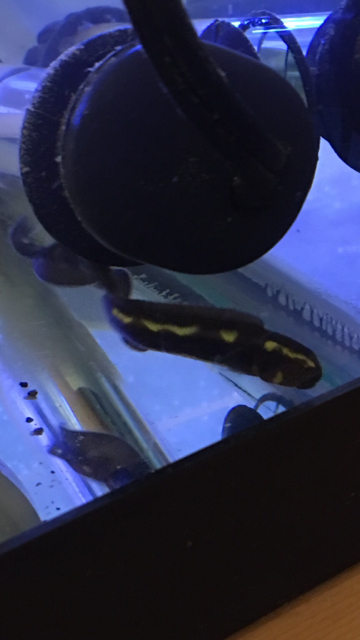 I'm going to have to tear the entire tank down, we have one goby that we've seen one time, everyone else I'll be able to catch pretty easily. All fish came from the established tank, unlikely the past owner ever QT'd. Only new addition is 5 turbo snails that I added Friday, I didn't QT them. On a more positive note, sump room is moving along. Should make great strides this week! Tank is buffed and looking amazing, I'll see if I can find some good before pictures for comparison. At least you caught it now vs dumping those little critters in the big tank! Couldn't agree more! We are well aware once a fish/invert goes into the 290.... There's a 99% chance it's likely never coming out. I'd much rather be dealing with it now than later. So it is a blessing that Ich is breaking out now. Not sure that's been said by anyone before, haha. Plans have changed to the tank transfer method (TTM) rather than hyposalinity to fight Ich. Temp isn't where it needs to be, so tomorrow the fish will all be making their way into the first hospital tank. Anyone have any ideas or links to some good "cat walk" examples for large tanks? Fish room is coming together and the space is filling fast, learning quickly that we aren't going to be able to have permanent "stairs" but need a catwalk like structure that can fold up or down. Ideally wanting to build/install the length of the tank. This week is boring on the fish room build, not much progress that you guys would notice, so I'll save you pics until hopefully this weekend when more has been visibly accomplished. As for now, our 40g (the 20g established we bought awhile back and moved into a 40) is fallow due to Ich. Started TTM yesterday. Man... 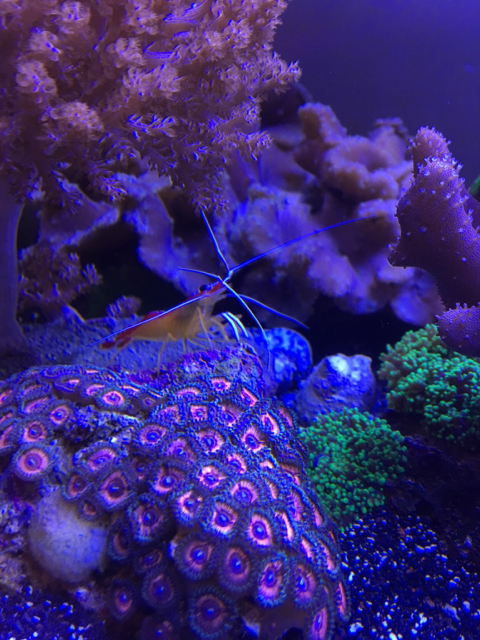 The shrimp are out and about without fish in the tank! Nice to see, I like watching inverts. Corals in this tank are all softies and then the plate coral. There's a ton of frags on the frag rack, we'll save those pics for another day. Post #61 I believe (around there) has his big tank catwalk. Very nice idea and he is very responsive to questions. Also.... Taggin along! 70 gal w/ 15 gal sump. 1 flame wrasse, 2 a. occelaris, 1 Bangaii Cardinal, 1 midas blenny, assorted CUC, 1 brittle star. You are the BEST! That's exactly what I'm looking for. Thank you, I'll be getting in touch with him. Got our reactor yesterday. Nextreef SMR1. We are using this as our phosban reactor. It's getting closer and closer now. I'm researching calcium reactors. I don't even know where to begin. We have a Milwaukee regulator we ordered with only a bubble counter. Now I need to figure out how to set it up, what to put in it, what am I looking for, Etc. we had our guys from our LFS over the other day, one worker laughed when he found our we're using a calc reactor, he said "have fun with that, it's a never ending nightmare". That has me a bit scared. Off to research I go to figure out how to use it for when we are ready. I want this to be a dominate SPS tank, so I need to get this figured out! We have an Iwaki 100 for our return pump and an Iwaki 70 to run the downward draft skimmer. They are both used. We're thinking of ditching them and purchasing the eco tech pumps. I am also researching the Eco tech to see if it builds enough head pressure off a downward draft skimmer. You won't need the calc reactor until a good several months down the road, after you've gone through the tank break-in period, the initial stocking, the stabilization period, and then finally have a regularized load of growing corals that start to demand more calcium than regular water changes can meet, i.e. don't add it until your weekly calcium test readings show a prolonged period of decrease. They can be finicky to get dialed in and require a stable amount of demand from your tank's inhabitants, but after that learning curve is mastered you'll be glad of it, as few other methods can meet calcium demands as well and as consistently. Dave, thank you! That puts me at ease and makes complete sense. Not sure what I'd do without you all! We are in Ionia, just west of Lansing about 30 minutes. I see you like Puffers, you'll be happy to know we are putting a porcupine puffer in our reef. Others will have opinions on this of why we shouldn't - but we are. Our last reef (72g bow front a few years ago) had a puffer and he was by FAR our favorite fish. So much personality it's ridiculous. I can't wait to have the fish room done for the QT's to be in place to start shopping for our puffer.